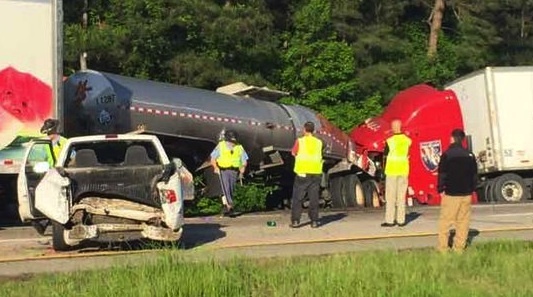 Tragic Crash That Killed 5 Students Exposes Trucking Company's "Appalling Safety Record"
While investigators are still piecing together the “complicated details” about what exactly occurred during Wednesday’s tragic accident that killed five nursing students from Georgia Southern University, serious concerns are arising not so much about the truck driver involved in the crash but about what is being called the "appalling safety/violation history" of the trucking company he was driving for. According to the Georgia State Patrol, the chain-reaction crash involved two tractor-trailers and five passenger vehicles in total. At around 5:45 a.m. Wednesday morning, seven nursing students were riding in two cars (a Ford Escape and Toyota Corolla) from Georgia Southern University in Statesboro to a Savannah hospital on Interstate 16. Investigators believe that the crash was initiated when the truck driver (employed by Total Transportation) plowed into the students’ SUV then rolled over the small passenger car, causing it to burst into flames. Four students immediately died at the scene and three were taken to hospital with injuries, where the fifth student was later pronounced dead. Authorities say that it is a complicated investigation that may take up to 6 months to complete and that it is still undetermined whether the truck driver, John Wayne Johnson, will face any criminal charges or traffic violations. But according to a witness who helped try to put out the fire at the scene, the truck driver is already devastated enough and had said, “He wish he died too.” Many are saying that this tragedy should not be a reflection of the truck driver himself but that the history of the company he was driving for should be a much bigger cause for concern. In fact, when it comes to unsafe driving practices, Total Transportation of Mississippi is considered to be one of the worst trucking companies on the highway and with 929 violations, people are questioning how the federal government gave them an overall “satisfactory” rating never mind allowing them to continue to operate on the road. According to the US Department of Transportation records, of the 929 total, 266 of the violations were for unsafe driving in the last two years alone and this includes their drivers being cited 107 times for speeding, 45 times for disregarding traffic control devices, 9 times for improper use of a cell phone while driving, and 5 times for failing to maintain a safe following distance. Not to mention the company’s trucking fleet receiving over 500 citations for maintenance violations and being involved in 85 other crashes leading to a multitude of injuries. Do you think truck drivers should have more protection and less liability, especially when it comes to working for companies that push the limits? Sad situation here, what I've found is no matter how much I distance myself from other traffic, you always have 4 wheeled vehicles taking that space up. All drivers trucks/4-vehicles are following to closely these days!? I just left a company that continually altered logbooks so drivers could continue to drive so as to make deliveries. Along with poor maintenance on their equipment. All for what? Driver safety? NOT! All about the almighty dollar!!! Bottom line is, it's the drivers responsibly to be safe. Some good points, but one thing that stands out to me in the article is the 500 violations for maintenance! 500! Not to mention 85 other accidents! While I totally agree that we drivers (8+ years, 1.25 million safe miles in the last five with my current company) are the ones at the wheel and are (supposed to be) in control, we have NO idea what caused this! Even the GSP said that it could take up to 6 MONTHS to find out! Stop rushing to judgment. What were driving conditions at the time? Was the driver distracted? Did he over react to something? Was he cut off? Did his equipment fail? About 3 weeks ago I was pulled into a scale in Arizona for a Level 1 and the inspector told me something that chilled me. He said that they regularly get requests from drivers to be inspected and placed OOS to force their companies to repair serious maintenance issues. So yes, companies should be held accountable at least as much as the drivers. One last point. Enough of the "Driver Code" nonsense, please. While I've only been driving for 8+ years, I grew up around trucks and "on the road" when I wasn't in school in the 70's. That means that I also remember spending a fair amount of time sitting on the side of the road with my mom and step-step-father (a used car dealer who ran two trucks and drove his own and also a small trucking company for a while) until I was old enough to drive and then by myself because of various problems. I can count on one hand the number of drivers that stopped to offer assistance. This was over a period of 12-15 years, before deregulation and after. So there's that. Also, 99+% of drivers have cell phones, so most of the time sitting waiting for someone to come out to determine the problem and to make repairs. Back in the day, the main reason that people stopped was to make sure that people were okay and to help them get somewhere to make a phone call. Again, been there, mostly as the one offering. Then there's the point that most trucks now require more specialized repairs, thanks to computers, sensors and OEM parts. Especially if you drive a Volvo. Gone are the days when "shade tree" mechanics can make most roadside repairs. Lastly, because of the society that we live in and the rise in hijacking, most (if not all) companies make it a fireable action to stop and help someone who has broken down. This is to ensure the safety of both the driver and the load. Both of the companies that I have driven for have had loads hijacked (and in one case had a driver killed in the process). So often it's more a case of the very real possibility of a driver losing his job overriding his want to help. And with ELOGS and accurate GPS satellite systems tracking our every move, companies are now calling drivers if they are stopped "in the middle of nowhere" for an extended amount of time. The only caveat is stopping for an emergency situation. We should all stop in those situations, and in many areas it's considered illegal if we don't. Unfortunately your the Captain of your ship and if the vehicle is unsafe and if the company has unsafe business practices then you shouldn't get behind the wheel .... I don't like to see any driver in this position but bottom line is your the person who decided to operate in these conditions !!! While I feel bad for the driver, it is HIS responsibility to maintain proper following distance and speed, while at the helm. I don't know what the circumstances were, I was not there, but if he was driving in an unsafe manor or doing something other than driving (phone, texting, eating ect.) he should go to prison, for a long time. Distracted driving is a major problem on our roads, trucking and public. If you engage in this type of behavior and something bad, goes down as a result, you should pay the MAXIMUM penalty. As for the trucking company; that is a whole different issue. If their record is that bad, they should have been shut down. If they weren't shut down, because of a government oversight, then the company AND the government should be held criminally and financially liable. Condolences to the families of the victims. Corporate greed? The driver always has the final say on accepting or rejecting the loads based on time and hos. A lot of times I find it to be the drivers get greedy and push the limit and accept load after load even if they are exhausted or they must break the law on hos. There are to many excellent trucking company's available to stay with one that is unsafe. Companies that tend to run with horrible csa scores usually end up hiring drivers that are equally below standards. My question in this tragedy is where did the department of transportation fail in ensuring this company and it's drivers were indeed capable of sharing our highways? The pictures of the cars on fire with those human lives trapped inside will always be in my memories. Despite the company's bad record how could this driver slam into the rear of the pack when it was stop and go traffic? I'm sure he feels like he should have been one of the casualty that day because he will never mentally be the same.